In the movie business we are used to never saying no, throwing money at problems and facing outrageous demands, but never had the Himalaya been so summarily dismissed. The French production manager needed locations for luxury fashion brand luggage – not living models, but suitcases out of a Paris museum, so precious that they would need their own security guards. Based in nearby Queenstown, the French crew helicoptered to sites on remote rivers, lakes and mountaintops — blissfully free of temples and monasteries — supported by movie Kiwis fresh from the set of Lord of the Rings. Whilst my production friend struggled with plans and decisions, Christian the chic Parisian design director delighted in the countryside: “New Zealand is so beautiful, the views parfait, the light magnifique.” Superstar photographer Eric Valli — tall, rumpled and irresistible — beguiled the team with adrenaline-fueled tales of honey hunters and birds’ nest collectors, and adventures filming Himalaya in Dolpo and The Trail in the Namib desert. I enjoyed working with Eric in New Zealand — his extravagant energy and positive spirit were contagious. He has long shared a special bond with the Himalaya, and my house is decorated with his gifts of Tibetan and Bhutanese textiles from way back. Eric’s two daughters were brought up with my sons, schooling together in Kathmandu and Melbourne. But we had never worked together before as he preferred to keep his projects mysterious and under the radar. With fame came a self-obsession that all of us found trying, including possibly Eric himself. It was a family game over drinks or dinner to count the number of I’s and me’s that he used in every sentence. The New Zealand photo set-ups were creative and complicated: a 1950s motorbike with sidecar on a grassy highland outcrop, a high snowfield with dogs and a loaded sled, a string of packhorses on a mountain top overlooking the lake, a rustic raft complete with sail and steaming stove, a safari tent beneath fern trees, and an elaborate treehouse deep within a beech forest. The precious historic luggage travelled in a secure truck with burly uniformed guards keeping a nervous eye out for rain. 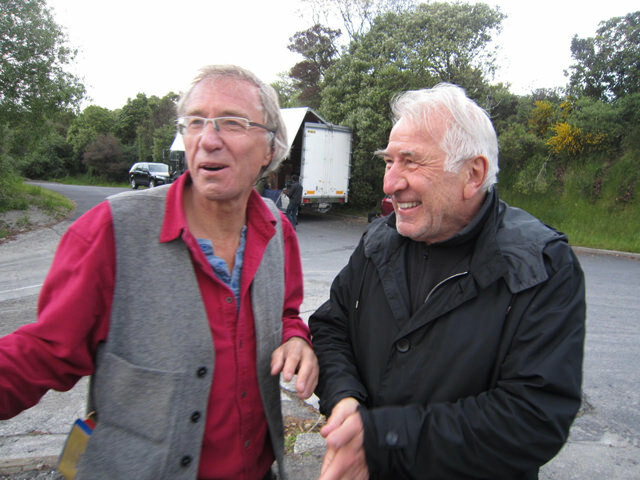 Eric Valli worked his magic, Christian continued his rapturous praise of New Zealand’s landscape and Caroline’s team, despite vacillations, variations and against all odds, somehow made it all come together. I was tasked with finding a location for one last shot — a lake jetty at dawn with distant volcanoes within reach of the antique floatplane that had been found in the centre of New Zealand’s North Island. 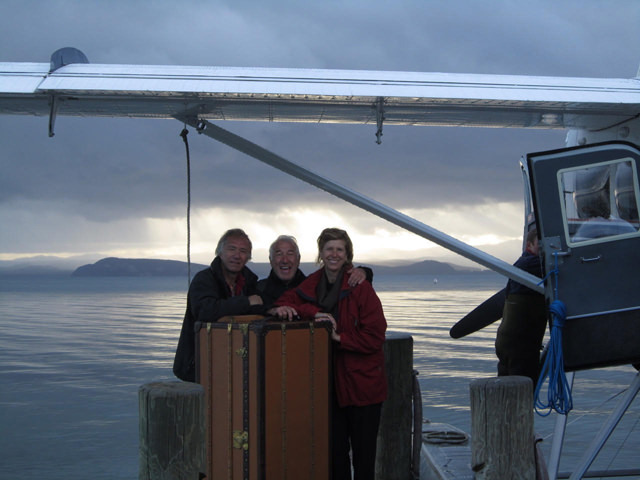 Permission was sought from the Maori custodians to film on Lake Taupo, Fred flew his floatplane down the valley and across the lake to Omori, and the French crew and New Zealand support team decamped to a rustic trout fishing lodge on the Tongariro River (Eric on ladder, left). Next morning at a chilly 4am I was driving too fast with Caroline through the dark sleeping village to the landing stage shoot when a grey cat ran out directly under my wheels, killed instantly. Its pale blue collar had a disk with a telephone number that I noted before carefully leaving the limp furry body in the tall grass by the roadside, and hurrying on. 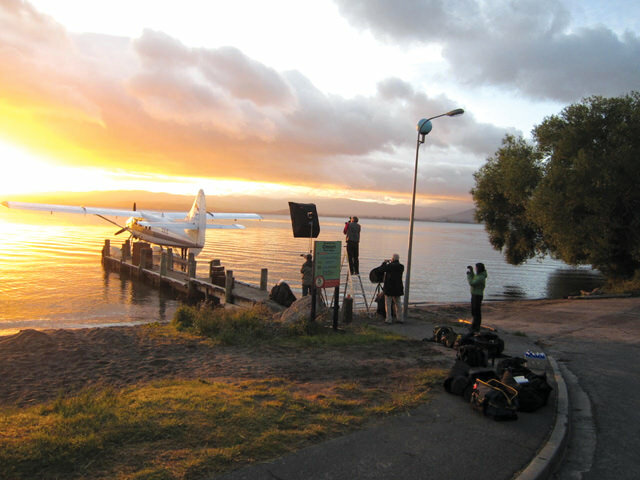 A spectacular golden dawn streaked across the lake, enabling Eric to secure the perfect shot of suitcases piled on the jetty in front of the float plane. But Caroline and I were distracted, saddened by the dead cat and waiting to call its owner at a civilised hour. After a quick sightseeing spin with Fred above the morning lake and fond farewell hugs, the jubilant French piled into large cars heading to the airport and Paris. The Kiwi team packed up and left exhausted and relieved. Caroline and I drove away slowly, dismayed to see that a large green council truck with a ferocious rotor blade was closely cropping the grass verges in the village.